This set is absolute junk. 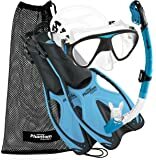 I have 35 years of scuba and free diving experience and purchased two of these sets to have as extras on the boat for anyone that may have forgotten to bring their own. I purchased them based on the many glowing reviews on Amazon. 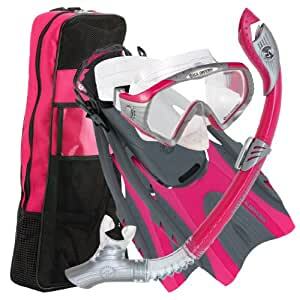 These must be left by severely inexperienced individuals who probably just used them in the pool or other calm water. The mask is stiff plastic, not silicone or rubber, the skirt of the mask cut everyone that used it for more than 30 minutes, the snorkel is about the only thing that worked as expected. The fins are not only junk but they are dangerous. I have never seen any fins as short as these were, because of this fact they are extremely inefficient and are ineffective in propelling you through a current. 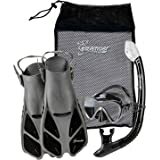 They also tire the user when he or she is trying to keep up with other snorkelers or divers who have proper fins. Trust me, spend a bit more for a better set, you will not regret it. 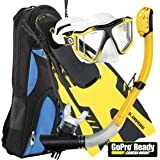 When I was searching for a snorkel set I was looking for a mask with a GoPro mount. The one that popped up was the neon black. I liked the set fine but changed my color selection to black when I placed the order. I didn't notice the description changes as well and it does not include a GoPro mount. I cannot tell you if the neon black really includes the mount but the black does not. It seems to me the two sets should not be posted together if they are not the same product or the description is wrong and needs changed. I will say, I returned the set and was issued a refund but it was a frustration as it was a birthday gift. As a side note, the fins are noted to change shoe size at 8 1/2 and 9. One size fits through size 8 1/2 the other starts at 9. The person I bought this for wears a size 8 1/2 or a 9 so I was worried about how they would fit but the 8 1/2 fins fit absolutely fine, as in plenty of room. I actually wondered if the wrong size had been sent the way they fit. I didn't care to investigate since I was sending it back but the fin size was odd. 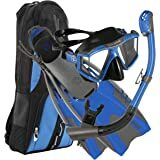 I've owned US Divers before, I own a set myself, so it was strange. The mask fit fine, with very little water seepage and the valve worked for expelling it without a problem. It fogged up frequently, however, even with anti-fog coating added. 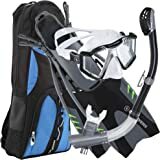 The snorkel works great, though I found the mouth piece to be a bit too large and after a while in the water, I felt irritation where it was hitting my gums and cheeks. The flipper look weird and I was a little worried they wouldn't work too well but I was pleasantly surprised by how fluid they felt on my feet while swimming. They were easy to put on/take off. I bought the larger size because I wasn't sure about male/female sizing and while they are probably a bit too large, there is plenty of room for tightening the straps so it doesn't bother me. They do seem a little more difficult to walk in them than other fins I have used though. The bag is a perfect fit. There is not much room for anything else, though I was able to squeeze vest in there as well. 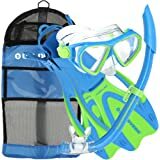 I originally bought this for 2 weeks of snorkeling in Cozumel and Playa Del Carmen, Mexico. 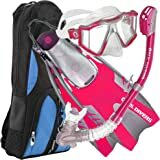 The first time I went snorkeling in Cozumel, water kept entering into the snorkeling tube. 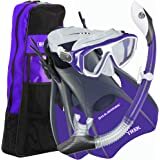 Apparently it was not sealed properly at the factory, and obviously I couldn't return for a replacement, so I had to go buy a replacement at a local snorkeling shop for $40 (ouch). Things were fine after that until I went snorkeling again (maybe 5th or 6th trip) and the goggle mask leaks now around the nosepiece. Fins works just fine. Carrying bag with pouch is nice. The rest is not very good quality. Go buy something else if you want realiable (or perhaps I need to spend hundreds of dollars for something that will last more than 5-6 trips). 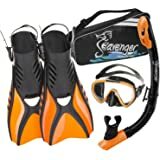 Just purchased this set to use on my trip to the Caymans. 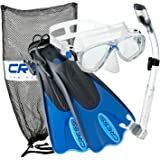 The set worked just fine for my use - casual snorkeling. The mask is great. The fact that you can blow water out of the nose of the mask was one of the best features. Even if the mask is leaking a little the water will pool in the nose and then you just blow it out. 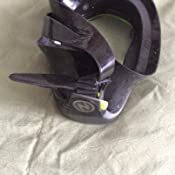 My brother bought one from Cressi that did not have this feature and he was constantly emptying his mask. I wear a 7.5 shoe and the M/L worked great. The fins are a little cheesy - but they did the job. The snorkel also works very well and has the blow out feature in case you get water in the top. 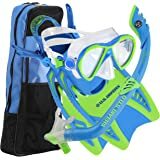 I'm usually not one that dives under the water but I was able to with this snorkel and get little to zero salt water in my mouth. I wish the case was all net for better drying. That is the only reason this gets 4 stars. Got this when we went to the Bahamas in 2014. Works very well! 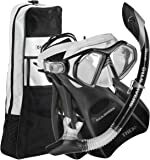 Mask seals good, flippers are quite comfortable, and the snorkel keeps water out relatively well. Only thing you have to watch out for, is if the water is choppy and you haven't submerged yet, water can still get in the snorkel. 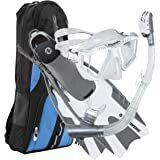 Bag is also super helpful, and fits another mask/snorkel set inside with this one! Fins were great, but mask was way too narrow for my face. I have a fairly wide face and often have trouble finding sunglasses that look right. But it seems that a rubber mask would have more ability to fit a wide range of faces. As it was, it tended to leak right around the sides of my eyes. Fins were pretty good, and snorkel worked well. I'll have to get a separate mask next time I plan to go snorkelling.